We reviewed the SmartRules app at the start of this year and found it powerful and easy to use. Now developers obycode have released v2.0 with a raft of new features and switched to an in-app purchase model to allow users to try out the app before paying for it. What’s New in Version 2.0 – We’ve switched to freemium! Now you can try out one rule for free, then unlock unlimited rules with an in-app purchase*. We’ve also added a bunch of new features, cleaned up the look and feel, and squashed some bugs. Added “and stays that way”! This lets you trigger a rule after something has changed and stayed that way for some time. For example, “Front door opens and stays that way for 5 minutes” or “Motion ends and stays that way for 10 minutes”. We’re excited about this one!! It’s really handy. All fields from your rules now show up in the rule screen, and no ugly shrunken text! See updated screenshots for an example. When editing a rule, it maintains the old values and jumps straight to the field you tapped! We know this was a major annoyance for many. Rearrange your rules! This long-desired feature lets you arrange your rules in any order you like to help keep them organized. Just long-press on a rule and move it wherever you’d like. The order in the app also defines the order of QuickTap rules on the Today screen and the Apple Watch! When a rule runs, it now shows in the SmartThings app’s messages list to help you track what’s been going on. There is now a confirmation before deleting a rule to avoid accidental deletions. Added a link to easily reach our new and improved help page directly from the app. Fixed some layout issues on smaller devices and devices with large text and zoomed settings. Swipe to delete for rules, triggers, conditions, and actions. 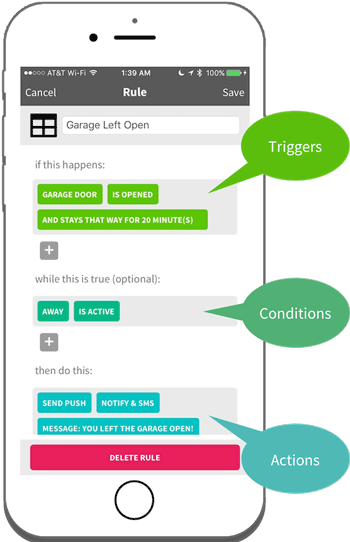 Be the first to comment on "SmartRules v2.0: Easy Logic for your SmartThings Smart Home"